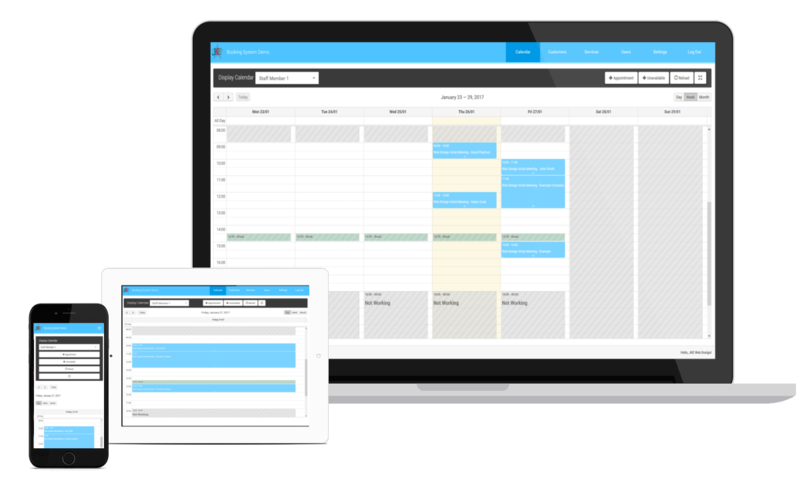 Perfect for sole traders needing a booking system to manage customers and save admin time. Perfect for businesses needing a professional booking system to manage multiple services. Perfect for business with multiple services and a number of staff dealing with bookings. Perfect for large businesses with multiple services, many staff and different office locations. You and your customers can access your booking system from a mobile, tablet, laptop or PC, on the road or from the comfort of home. Our booking system is web based allowing you to access it from anywhere at anytime with an internet connection. No. We will help you set up your online booking system and guide you through all the features free of charge. No. You can cancel at anytime and we will stop your subscription at the end of the month or we can can freeze the account during times when you do not need the booking service. If you have paid for the year upfront there will be no refund on remaining months. No. There are no charges taken per booking and there is no percentage taken from what your customers pay for your services. You pay the set fee as stated for the package that suits you. This can be paid monthly or we will give a discount for yearly payment. Do you limit the number of bookings? No. All our packages come with unlimited bookings, we do not think you should pay for a booking system only to be told you can not make more than 200 bookings per month.